It’s spring here at last and the sap is finally rising. The daffodils are smiling, the blossom is blossoming and the birds are singing enthusiastically by 5 am every morning. It’s just wonderful! Another short break has ensued from posting here while I had my two week long birthday festival, followed by a mild case of flu, followed by a back that got put out by all the festivities, followed by trying to catch up with everything that had got away on me. All is well again now and we are good to go as we cruise towards summer. Of course I kept on making stuff all this time – several light catchers got sent off for example – and not a one of them photographed before doing so……. Sigh!! Miles of decorative tape got made – such an excellent activity when you only have energy to plop yourself onto the sofa and keep yourself amused with doodles and colour – a few cards got put together with said decorative tape and a few note books and journals found themselves titivated up as well. Serious painting duties have now resumed. Decorative Tapes are made by laying down strips of masking tape onto plastic cutting boards, the kind that you buy from the $2 shop, and painting them or doodling them start to finish. The centre one in the photo below is all doodles, the other two are painted and when dry I used gold paint through stencils. The one on the right has additional doodles. Loads of fun! A journal cover for the official photographer – who incidentally took none of these photos – but that’s okay as I’m not that enthralled with the quality of cover that she received! 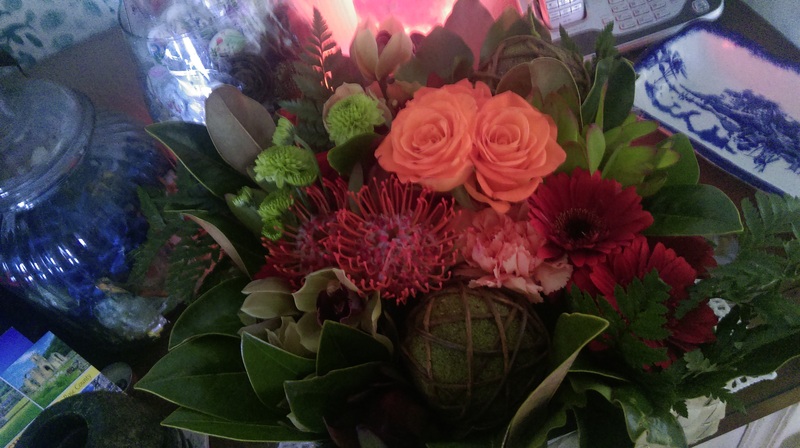 And I’ll leave you today with a small peek at an amazing basket of flowers received from Ms Laurie at Life on the Bike and Other Fab Things for my birthday. 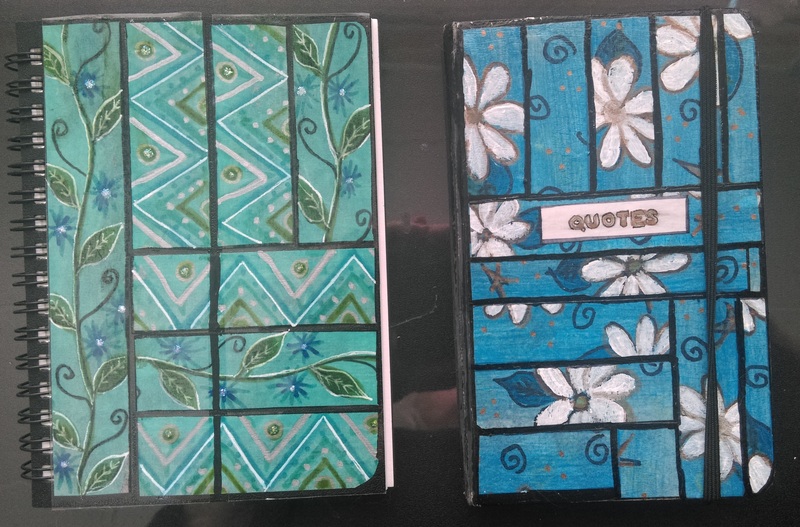 This entry was posted in Creations From My Craft Room and tagged covering notebooks with decorative tapes, decorative tapes, doodling by thecontentedcrafter. Bookmark the permalink. A very belated Happy Birthday, Pauline. I am glad you had a good, lengthy celebration. Not so great about the back, though, except that being less mobile allowed your creativity to fly. Love the tape. A belated Happy Birthday to you …. but a 2-week birthday celebration? WOW … what did you do? Seemingly a grand time for all! A belated Happy Birthday Pauline! I hope you had a wonderful day and have fully recovered from your bout of flu. Gosh you have been busy with all your projects, the decorative tape is such a lovely idea and with so many uses too, I particularly like the notebook covers. Beautiful and inspiring as always! I’m inspired by your decorative tape making! Gorgeous! Hello! And thank you Wild Daffodil – I hope you’ll make your own too, it is so much fun! Your decorative tape projects are so cool! I always love perusing your fantastic scope of crafts. I really miss having time for my creative projects, but someday. I love spring, it’s the season of promise. Glad you are feeling better, I pulled my back out this summer, I was so frightened as I really thought it was serious. Take care, xo. I know, it sounds great. I hope to someday….maybe folks will start buying my books and I’ll get there faster, lol….probably not, but it’s a nice dream. My goodness, look what i missed while I was away. Pauline, spring has arrived and you are in the zone! I’m so happy for you (except for the flu part…boo to that). It sounds like a wonderful few weeks of birthday celebrating, followed by a lot of creative flow. I’ve never seen self-made decorative tape. Is this your own invention? 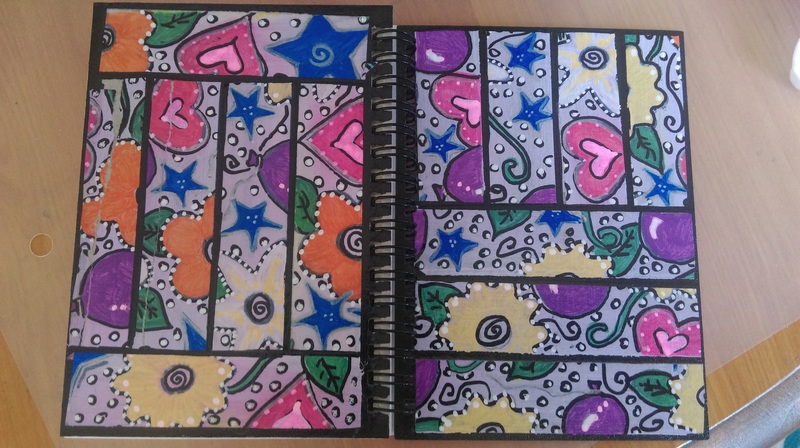 The colors and doodles are so vibrant, and I especially like the gold overlay. 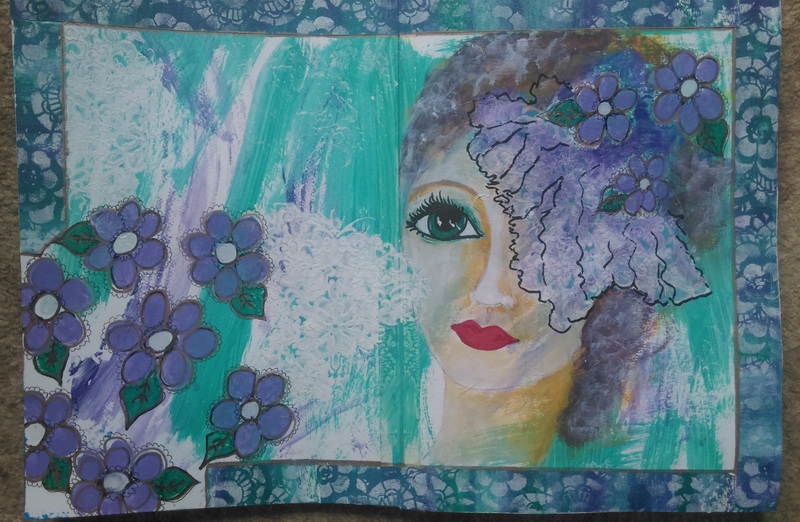 I also know how fun it can be to use up things you have on hand, so congratulations on making your leftover paints into cards, journal covers and the like. I rather like the cover for the official photographer. Perhaps it’s not your favorite because of the colors. Are those her favorites? I’m with Laurie on a New Zealand craft day. It was wonderful watching Kelly create in her own space. I would so like to see you do the same. Now that fine weather is upon you, I hope that is the last of the chill for a good long time. You poor thing. I’ve never seen the crafting tape idea. I’m not spending enough time on Pinterest! 😉 I love the tape on my package, and didn’t realize till you mentioned it that it was one in the same from your post. It looks professionally done. I’m looking at the box now and I’m still amazed that you made it. We are going to have such a wonderful visit, Pauline. I’m getting excited, and hope the planning will soon commence. I’m also looking forward to our Skype, just a few short minutes away. When we all gather in NZ, can we have craft day? I really need to learn how to do some of these things! Your work is lovely AND made with love. So sorry you had the flu, and hoping that you are completely healed by now. My wish would be for someone to get a hold of Hallmark or a card company and show them your creations! I would buy your cards since I really love the designs, color and sweet details. The journals are great and there are many people who will benefit from your sharing the masked tape projects.yours are fabulous, Pauline! Belated Happy Birthday! Glad you are feeling better. I love what you call “just doodling”. You have quite the artist’s eye. Who knew such beautiful things could be done with masking tape? As you are welcoming Spring we are into Autumn. I look forward to seeing more of your beautiful art. Hello hello Pauline! I’m sure with spring knocking at the door, you’ll soon be dividing your time inside and outside. Do you ever paint en plein air, perhaps your garden or the beach? I think it so nostalgic and european to see someone, long brush in hand, dabbling on a canvas. Of course we are rolling into fall, actually quite briskly now. c’est la vie. Hello my little Canadian friend!! I know you are so busy – what a wonderful way to be kept busy though! I got sick because the weather was so very changeable and I went walking one day starting off on a balmy spring morning and thirty minutes later dashing [I say ‘dashing’ – but really, just puffing] my way back home through sleet. I got a chill and languished like Camille for a week, putting my back out when I sat to the computer incorrectly and then sneezed violently……….. Honestly, what a crazy silly thing to do!! All is well now though, better than ever in fact! I don’t paint outside as I work flat as I use so many different media and would have to take a ton of stuff with me – and I don’t paint from real life anyway. Though Danella once had a dream about me doing exactly what you are thinking of 🙂 Never say never! Sounds like you had a productive although quiet birthday. Allow me to send along my belated greetings-perhaps late but heartfelt nonetheless♡♡♡. Such delightful creations! 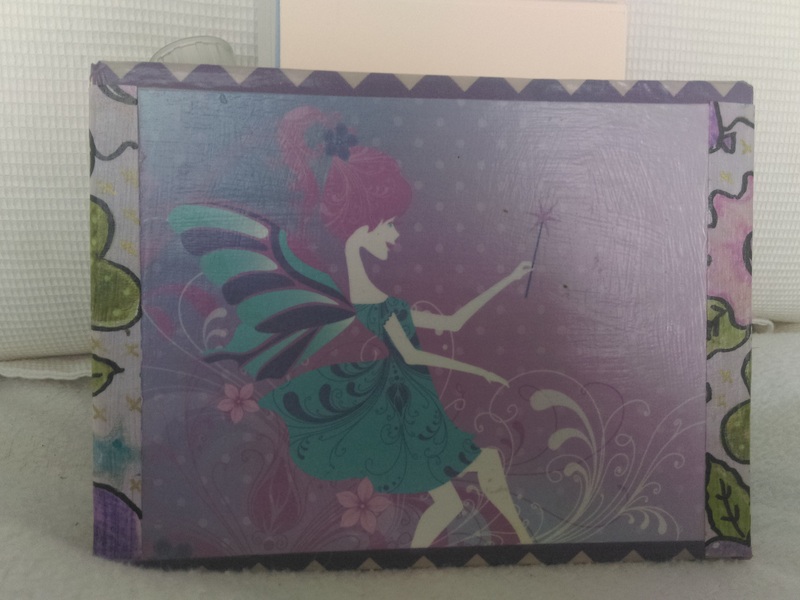 The journals are so unique with your personal embellishments. I never would have thought such a thing and had to read the comments to see if you divulged some of your techniques. (not that my crafting or painting skills would qualify). So fascinating with a beautiful result. You continue to wow me with your creativity, Pauline. Glad you are enjoying spring. Always so nice to hear from you. Hugs! You are just too modest! ♡ I am so fascinated ( and impressed) with all of your creative projects. It looks like you’ve managed to be very productive even when you weren’t feeling 100%, CC. Your use of the tape on the pretty notebooks is really nice. I hope your back is fully recovered. A sore back is a great annoyance and very incapacitating. Pleased to hear your back is feeling better. You turn doodles into an art form, Pauline. I’m really intrigued by the decorative tape and that it doesn’t lose its stickiness post-doodling and pre-journal decorating. I read your post first on my tiny phone screen but had to come back an see all your creations in big. They are so pretty and feminine and happy! I am delighted (truly) that it is spring in your part of the world. We all so deserve spring when it arrives. I have never heard of this art form before and so I found it fascinating. I am thinking of the top of my old oak desk which arrived damaged with spilled ink and other stains. Do you think it would hold up? I bet it would if I had glass over it. Some spring sun will no doubt help you and I believe a lawn chair in the sun is required. But, don’t stay in it too long as one’s back can “go out” just from laying down. I like that line about how perfectly arranged it when Spring arrives. Don’t you love it when that happens. Yes, I meant the tapes and I do know about polyurethane yellowing, just as the white paint in my kitchen is yellowing. I think a marine varnish might work or maybe glass would be the easiest. Thanks for your answer. Happy birthday, Pauline and the craft work looks marvellous. Hope the flu/back impediments are gone and spring is in your step. My step is not just springing, it’s back on form and leaping about enthusiastically 🙂 Anything is possible! Happy birthday Ms Pauline! I see you had sufficient merriment to put your back out. Now THAT is a birthday to remember! Excellent crafting as usual and the flow of creativity is strong in you young Padawan. Heh, heh!! Zoom, zoom [that’s my light sabre] At this end of the life spectrum it’s starting to feel like every birthday is a birthday to remember 🙂 Hope you are well, I miss your posts! We have been holed up in our bunker (house) surrounded by a sea of mud and only venturing out in our wellies to release the chooks. I have been beavering away finishing off some monster dolls as well as learning to adore the knit stitch in Tunisian crochet. It’s just like knitting but without that “BLOODY HELL I DROPPED ANOTHER STITCH!” problem ;). Glad you are still wielding your light sabre with power and joy Ms Pauline. Serendipity Swamp (Farm) will be back soon. Those fridge wickers are all half full of water and we have renegotiated where we are going to put them now so this is going to be interesting to say the least! Your comment about the longevity of the presidential election just tickled my funny bone. I just don’t turn on the telly anymore. We are a laughing stock here and I’m terrified of the result. On to brighter things. I shall have a photo for your collection soon. I love that Miss Joy lives happily in Oregon where she can be seen daily by whoever walks in the door. 🙂 The decorative tape is such an interesting idea and I love it. But Miss Joy on the journal is my favorite. I have to tell you, I find it fascinating that you too, came down with something at your birthday time. At the end of my birthday celebration I felt quite ill for a week. I called it the snizzles but the rest of me was under par as well. I shall check with my other Virgo friends and see how they fared on their day. We are going int autumn and it’s quite chilly out. I must go dig holes now so I can move my rose bushes and plant a gifted blueberry bush. Fall is the perfect time. The rain will be here tomorrow and the clay is heavy to carry up the hill. I’d best get on it. Love the rain so I can do creative work inside. 🙂 Silver lining to everything. What kind of paint did you use on the tape? I was thinking marker pens might work??? Fascinating!!! Yes, marker pens, paint pens – anything permanent really. I like it best when I lay down a light wash of paint – or a dark wash of paint [up to three colours] and then doodle. But on the days when painting wasn’t possible just doodling was hours of meditative activity. Try it you’ll love it! PS I love blueberries!! I hope your bush thrives and offers you loads of those gorgeous juicy little balls!! Belated happiest blessed birthday Pauline! ❤ Reading from this post I am assured that you had a blast. Love and happy wishes surrounded you on your special day. Truly blessed! And these artworks, they are a sight to see. Colorful, useful and full of love from you. I just finished reading a post about the wonders of autumn and then came to yours, singing the praises of spring! That’s one more thing I love about blogging! It sounds like a wonderful birthday celebration even though you had the other struggles–I can tell those are behind you now–you sound great and you’ve been so busy, busy, busy! Awesome, Pauline. I’m blown away by your beautiful crafts. Happy belated birthday. I’m sorry I missed that memo. I’m pleased the festivities went well, but not so happy to hear about the aftermath. I hope you are back to contentedly crafting now. The evidence appears to support that. I would never have thought of decorating tape, and you must have read my mind because, as I was wondering how you did so, along came the explanation. It just amazes me. Your tapes are gorgeous and I love the uses you have put them too. My favourite of all your crafts here today (and it’s difficult to choose from such a lovely array) is the “Choose Joy” cover. It is joyous to look at, and I so admire your skills. 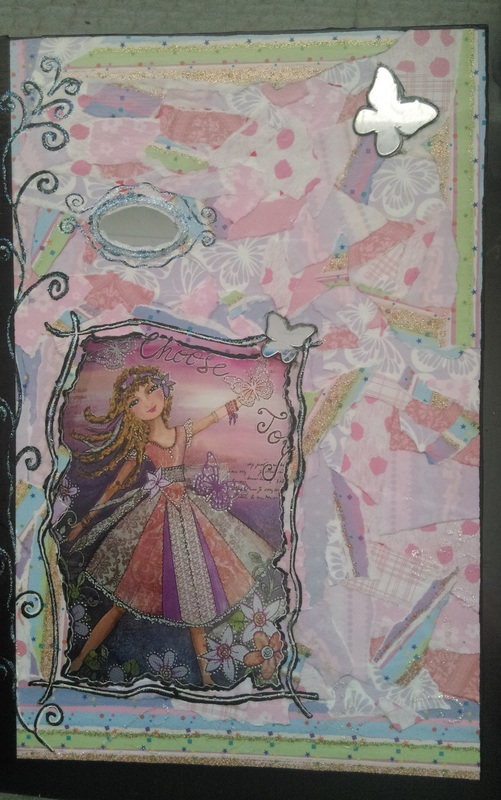 I also love the journal page, almost edged with decorative tape. Thank you for sharing these lovely works. They have helped to lift my spirits today. Yes, spring is on its way with birds singing, and flowers blooming. What’s not to be joyous about! Well I think it’s beautiful! You won it so far as I’m concerned! Oh, Pauline…I was not aware of the flu and the back that got put out… so sorry to hear that, but glad for the mending…….hmm..I can only wonder what dance you were doing at the time of that back mishap…the twist? the funky chicken? 🙂 But it looks like you have been using your convalescence well. The tapes are so pretty, I would have a hard time to resist putting them on everything. And I am so, so glad for you that it is Spring— a season I know you love. Things are looking up and up…. The sad story of the back does not involve any dancing. It involves someone sitting not quite straight to her computer and sneezing violently. 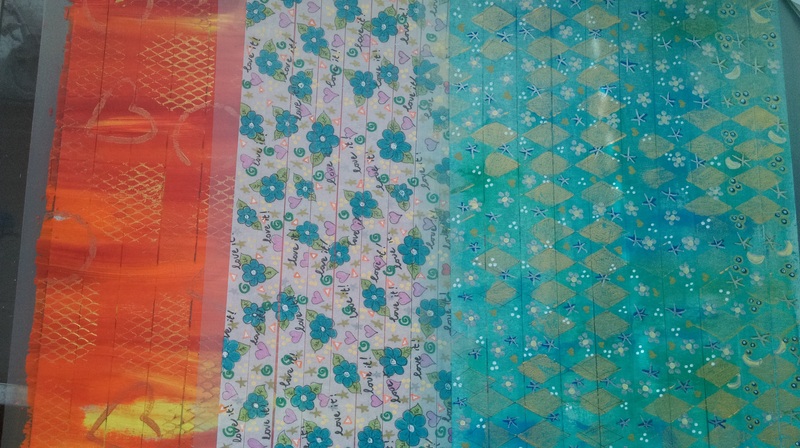 🙂 I was rereading your note to me about the joys of creating with paper and thought you would so enjoy making these tapes and would do such lovely things with them……… Perhaps a nice winter activity…….? By the way, I followed up on your mention of John Bergman and have totally enjoyed a couple of his youtube videos. His beliefs jibe perfectly with my own, as I am planning to try and reclaim the good health of my joints this winter. It is my ambition to walk the Appalachian Trail right in my kitchen and living room. If it all works out I will be back to my beloved Tai Chi routine by spring! Now this is excellent news to rise to Cynthia – you go girl! I’ll join you in the Tai Chi which I have always wanted to learn but haven’t gotten up the courage to seek out a class – yet. I enjoy Mr B very much and he is behind me getting my act together and moving on from my static health status. I’m fully back on the food menu that works for me and staying totally organic again. Along with homeopathic rose quartz I’m already feeling so much better!! Go us!! My partner Mary and I learned TaiChi from a funny Chinese man back in the early 90’s who wanted no fooling with any new-age metaphysical talk about it. He had been doing it since he was a child…he wore no special outfit, just his jeans, shirt and running shoes, and the classes were perfectly silent, conducted in a dimly lit school gymnasium, though sometimes with soothing music. He never wandered around “adjusting” our erroneously posed hands or feet, he just did his thing at the front of the room and we followed his motions, intuitively learning many intricate routines. You just did it—no discussion of right or wrong. Other classes I had taken–with non Chinese instructors, were annoyingly wordy and directive. 🙂 We need an appropriately aged Chinese man ………..
A belated Penblwydd Hapus Pauline. I’m sorry you’ve been in the wars recently. Let’s hope Spring leading to Summer sees things improve a lot. Here of course we’re in Autumn heading for Winter but not too many signs of it yet except for Christmas goods appearing in the shops (already). A non too subtle hint to start my shopping I suppose. Hello David – you will have to teach me how to pronounce that Welsh phrase – I would love to be able to say it! Thank you for it.